The Bass Shop did the partial restoration on this bass 9 years ago now and still holding strong, I have thoroughly checked all the cracks (see pics) and all are sealed and closed. This bass is setup for classical with Aubert French adjustable bridge, Helicore Orchestral strings, and bag. Also Available which came with this bass is a J.Ellender French bow with certificate, please check the bows section if you wish to acquire separately. This beautiful Da Salo copy recently came in to the shop for sale, made in 2015 the bass is an extremely good representation of the masters work. The finish is an even deep red brown with some aging techniques added to give a period appropriate look. Unlike allot of relic finishes on today’s basses this is applied subtlety and thoughtfully. The sides and back have good medium flaming with the double purfling line accurately placed on the top and back plates. the top has a very even arcing with high grade spruce top. The bass would be ideally suited to a intermediate to professional Arco player looking for a rich dark sound. This is one of only a few block-less basses I have seen in Australia in my time, generally the block-less bass has a full tone with good projection making it ideal for arco playing although equally comfortable with pizzicato . This bass was fully restored by N.S.Brawley. It is colored in a beautiful satin dark chocolate spirit varnish. The color compliments its tone which has a full rich bottom end with warm but articulate highs. The bass has been setup with Pirastro Flexicore strings, Aubert adjustable french bridge, and a heavy duty bobelock case. The maker of this bass is unknown but it is possible its from Mirecourt some time in the early 1900’s, this bass has been restored here at The Bass Shop. The scroll is an open French design with Bakelite tuners. Its has a very even umber color varnish which has been beautifully applied. The ribs are plain in appearance with slight flaming more flame is present on the back plate. The overall cut of this bass is very symmetrical which shows the skill in the construction of this instrument. 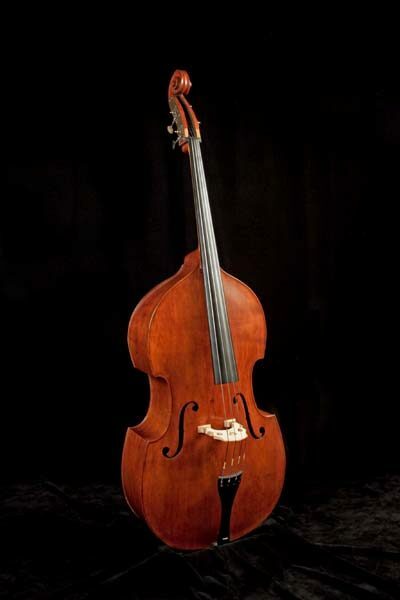 This flat-back German bass has been fully restored with a hybrid setup for both Jazz and Classical styles. This bass has a wide spruce top with relativity straight grain. The varnish is oil with burnt sienna shading. The back and ribs are plain with little flaming. The neck is beach and original. fingerboard and tailpiece are good quality ebony.